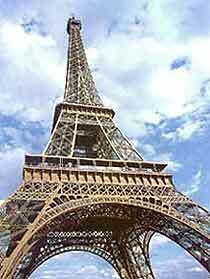 Paris attraction-guides.com - Paris, France attractions guide featuring Paris, Ile-de-France The Eiffel Tower information, including location, contact details, opening hours, admission, history and general Paris, Ile-de-France, France FR The Eiffel Tower information. - Last updated 30/10/2012. Exhibition of 1889 to commemorate the centenary of the French Revolution, the Eiffel Tower is visited by six million people a year. An outstanding engineering achievement, designed by Gustave Eiffel (who also designed the framework for the Statue of Liberty) the tower was originally disliked by many Parisians, but has now become a famous symbol of French civic pride, and was the world's tallest structure until 1930. Visitors to the Eiffel Tower will enjoy breathtaking views of Paris from all floors of the structure. Although it stands 320 metres / 1050 feet high, it is possible to walk part of the way up and around this fascinating metal structure. A lift completes the journey to the top.